People of Mahatma Phule road are now used to seeing this “WORK in PROGRESS” boards (not many are there now) as on December 5, 2009 work had begun on this road to be widened to 120 feet. All the houses coming in the way, a old well all were brought down by the machines and now after year still the road is incomplete. Only one side of the road has been tarred and no work is taking place on the site. The delay is understandable as the said works contract was supposed to be completed on 28 January 2010. This road was supposed to be connecting Bank of India to Govaves, but nothing has happened after the Phule road, only road of mud exists. 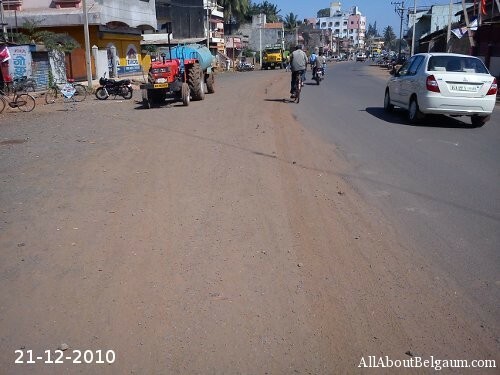 The Urban development ministry has said that Belgaum corporation was the worst in implementation of the Rs.100 crore grant and this is one of the reason. What is taking so long is still unknown. The local MLA who had taken so much keen interest in starting this work and who had placed his boards all over the road claiming development, can youy answer why so much delay. 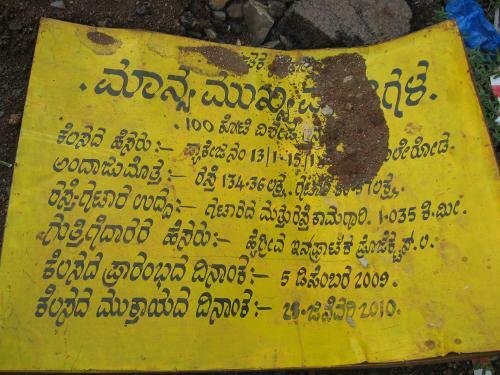 I was shocked to read this road was started in Dec 09 is it going to complete? The Congress road dug is to only and only provide water to VTU..
Well, Why they had to take the pipe long so long from the entire city to reach out 15 kms away just to provide water!!! Places Like Thirtkunde which is 3 kms from VTU has 2 major rivers flowing, they could have just done it from there by reducing the cost and get water from there to VTU and Belgaum too…! Even getting Water from Khanapur was feasible.. But.. as we know.. This is the only way to loot and show that they are doing development!! Don't know form where will they get water for Suvarna Vidhan Soudha.. I think they will Get the pipeline from Bijapur via goa and Hubli!! !